Pedro Cahn and Linda-Gail Bekker at AIDS 2018. Photo by Liz Highleyman. A two-drug combination of dolutegravir (Tivicay) and lamivudine suppressed viral load as well as a standard three-drug antiretroviral regimen for people with HIV starting treatment for the first time, according to results from the GEMINI studies presented yesterday at the 22nd International AIDS Conference (AIDS 2018) in Amsterdam. Response rates exceeded 90% with both dolutegravir/lamivudine and dolutegravir plus tenofovir/emtricitabine (the drugs in Truvada), showing that the dual regimen was non-inferior to standard therapy. But the dual regimen led to fewer side-effects including kidney and bone problems, reported Pedro Cahn of Fundación Huésped in Buenos Aires. HIV treatment is life-long and anything that reduces drug burden would be welcome for patients, Cahn told reporters at a Tuesday press briefing. A two-drug regimen would potentially offer less cumulative drug exposure, fewer side-effects and lower cost than standard therapy. Dolutegravir is a potent integrase strand transfer inhibitor with a high barrier to resistance. Lamivudine is a well-tolerated and inexpensive nucleoside reverse transcriptase inhibitor (NRTI) with available generic versions. Previous studies have shown that dolutegravir plus lamivudine maintains viral suppression in people who switch from a triple regimen with an undetectable viral load. A combination pill containing dolutegravir and the non-nucleoside reverse transcriptase inhibitor (NNRTI) rilpivirine (Juluca) was recently approved in Europe and the US, but only as a switch option for people with suppressed viral load. Cahn's team aimed to show whether dolutegravir/lamivudine can fully suppress viral load when used as initial treatment. At the 2016 International AIDS Conference in Durban, Cahn presented promising results from a small pilot study known as PADDLE, which enrolled 20 previously untreated people with viral loads <100,000 copies/ml. This year he presented findings from GEMINI 1 and 2, a pair of large phase 3 trials that permitted patients with viral load as high as 500,000 copies/ml. Together, the GEMINI studies enrolled 1433 participants in Europe, North and South America, Asia, Russia and South Africa. About 85% were men, two-thirds were white and the median age was approximately 32 years. At baseline, 80% had viral load <100,000 copies/ml, while 20% had high viral loads between 100,000 and 500,000 copies/ml. Most had CD4 cell counts above 200 cells/mm3. People with hepatitis B and those with hepatitis C requiring treatment were excluded. Participants were randomly assigned to receive dolutegravir/lamivudine or dolutegravir plus tenofovir disiproxil fumarate (TDF) and emtricitabine (an NRTI similar to lamivudine). The primary study endpoint was the proportion of people with vira loads below 50 copies/ml at 48 weeks after starting treatment. At week 48, in a pooled analysis of both trials, 91% of dolutegravir/lamivudine recipients and 93% of dolutegravir/TDF/lamivudine recipients had undetectable viral load in an intent-to-treat analysis. Response rates were high for people who started with either lower (91 vs 94%, respectively) or higher (92 vs 90%) viral load at baseline. However, among the minority of patients with low CD4 counts, the triple regimen appeared to work better in a snapshot analysis (79 vs 93%). Looking at treatment failure, 3% of dolutegravir/lamivudine recipients and 2% of dolutegravir/TDF/lamivudine recipients were considered virological non-responders. In each treatment arm, 1% or less had confirmed virological failure. No treatment-emergent integrase or NRTI mutations were seen among these participants. Both regimens were generally safe and well-tolerated. Dolutegravir/lamivudine was associated with somewhat fewer drug-related adverse events than the triple regimen (18 vs 24%), but rates of withdrawal due to adverse events were the same in both treatment arms (2%). The most common adverse events in both groups were headache, diarrhoea and sore throat or upper respiratory tract infections. TDF can lead to impaired kidney function and bone loss in susceptible individuals, such as older people and those with pre-existing conditions. In these studies the dual regimen had significantly less detrimental effect on serum and urine biomarkers of kidney impairment as well as markers of bone loss. Changes in blood lipid levels were similar in both groups. These findings, the researchers concluded, "support [dolutegravir/lamivudine] as an effective option for the treatment of HIV-1 infection." This was the first time a study has shown the non-inferiority of double versus triple therapy, Cahn said. He added, however, that dolutegravir monotherapy should not be recommended, as other studies have shown that a potent agent like an integrase inhibitor or protease inhibitor needs to be combined with a reverse transcriptase inhibitor. "I'm very comfortable using this as a strategy," Cahn told reporters. "It's not one size fits all, but for some people it's a very safe and potent combination with less drug burden for our patients." Asked at his presentation about the use of this strategy in settings where baseline viral load testing could not be carried out before treatment initiation, Cahn replied, "Don't try this at home" without appropriate monitoring. Cahn P et al. Non-inferior efficacy of dolutegravir (DTG) plus lamivudine (3TC) versus DTG plus tenofovir/emtricitabine (TDF/FTC) fixed-dose combination in antiretroviral treatment-naïve adults with HIV-1 infection – interim data from the GEMINI studies. 22nd International AIDS Conference (AIDS 2018), Amsterdam, abstract TUAB0106LB, 2018. 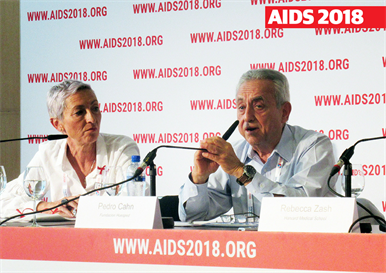 Download the slides from the AIDS 2018 website.